This carpet tile fitting kit is essential for both professionals and novices alike looking to lay carpet tiles themselves. The DIY kit comes neatly sealed and packaged and includes everything you need to complete the job. These high quality durable tools will stand up to the rigours of any busy workplace or workshop where multiple use is required. Also enclosed in the box is one of our handy fitting guides showing step by step instructions on how to complete the process of laying carpet tiles. Click below for more details and to see the full list of box contents. This fitting kit comes completely free with all pallet orders of 800 tiles and above. The fitting kit includes several handy tools, one of which is a heavy duty aluminium ruler with handle. This is the perfect accompaniment when looking to cut the more awkward shapes and profiles found within most rooms, corridors or stairways. The handle ensures safety at all times, making sure no trailing fingers are in the way of the sharp bladed utility knife. We created this fitting kit ourselves for customer convenience, making it easy to order and receive everything on the one delivery. The tools are great quality and from a well-known brand who manufacture all manner of tools for trade and domestic use. Several customers have purchased the fitting kit and found it invaluable when laying carpet tiles. We would like to mention that the fitting kit does not include any adhesive so this will need to be purchased separately from our site. 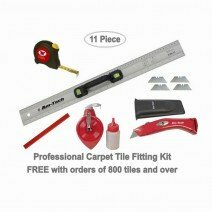 The tools included in this fitting kit are just for laying carpet tiles, therefore if any remedial work has to be carried out first in the form of making good, e.g. using floor screed, then the tools included in our pack are not suitable for this. At present we do not sell floor screeds on our website, there are many types manufactured, each for different jobs and surfaces. We do not stock any flooring screeds and are unable to offer advice on which is the correct one to use for your application. We advise you to visit your local flooring supplies builders merchant or DIY store for this and they should be able to assist you with the correct product to use. Carpet tiles can be fitted onto any sound concrete or wooden floor without the need for underlay. The built in bitumen backing eradicates the need for this so the tiles can be laid straight on the bare subfloor. Also the carpet tiles should not be laid on top of any pre-existing floor covering, no matter how flat. The tiles can curl if not laid flat onto a hard surface and we do not recommend this way of laying carpet tiles. As long as you have followed the guidelines for acclimatisation and correct adhesive/floor preparation then tiles will not shrink or curl as this is an ‘urban myth’. If you are unsure about laying carpet tiles on your floor then we are always here to answer any questions and can offer appropriate advice on what product will suit you best. Although we provide a printed paper copy of our fitting guide in every box of the fitting kits, you can still view online if needs be. Also on our site is a wealth of information and help on how to achieve a great looking floor in the shortest amount of time. While due care and attention is advised we try to help you by avoiding those bumps in the road which can happen when fitting carpet tiles for the first time. It is important when laying carpet tiles that you use a fixed blade knife as the retractable type can force back into the body of the knife when excess pressure is applied. The 3mm bitumen back is quite hard and reasonably difficult to cut through so scoring the tiles from the back, similar to cutting sheets of plasterboard, helps to ensure a clean edge. You then simply flick the carpet tile over and cut from the other side making sure not to pulls any loops or fibre from the tiles edges. Included in the fitting kit is 2 brand new spare blades which are imperative when trying to get crisp clean edges when cutting tiles around the perimeter of your room. The longevity of the heavy duty blades can be lengthened by dipping the blade into a bar of soap or by wiping with white spirit. This stops the blade from clogging up with the bitumen residue left behind after a few cuts have been made. Please make sure extra care is paid when dealing with new blades or cleaning as they are razor sharp and very dangerous. *By law, we have to advise that the knife included in this kit is not for sale to anyone under the age of 18. When placing an order for this product, you are declaring that you are 18 years of age or older. Please note these items must be used responsibly.